The firm behind a new rail link from the North East to London plans to use a fleet of trains built in China. Grand Central will run services between Sunderland and Kings Cross three times a day on the East Coast mainline. 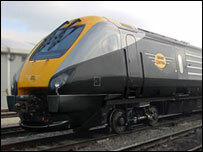 The company intends to launch the service with refurbished 125mph High Speed Trains (HSTs) on 20 May. But it will replace those trains with the 140mph Chinese "Polaris" fleet in mid-2010, if its five-year track access contract can be extended. The firm bought the HSTs in 2006 and is spending about £5m refurbishing them in time for the launch of the service, which will also call at Teesside and North Yorkshire. Ian Yeowart, Grand Central's managing director, said: "Our three HSTs will be ready for operation later this year and they're very impressive, but only good for about 12 years. "We've been looking around the market place for better-performing and greener replacements, and that's easier said than done. "Not many companies were willing to build such a small amount of trains, but the Chinese are very keen to get involved in the rail industry. "These are going to be hi-tech, purpose-built trains, and we're confident they'll be better than anything currently running on the rail network." According to Mr Yeowart, the Polaris fleet will run on diesel, but with the capacity to upgrade to electric or hybrid engines. The company hopes to order the trains this summer, but will first need to secure an extended track-access contract with Office of Rail Regulation (ORR). Grand Central is also pursuing plans to run trains between Bradford and London, after an application to launch a service between Newcastle and Manchester was rejected by the ORR.